The design of the leveling is done directly on the terrain model and it is totally interactive; positioning takes place with the setting of the heights on three points or by the height of two points and the gradient of third. 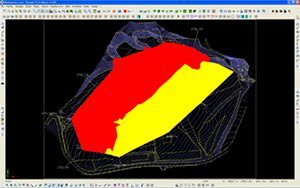 The calculation of the intersection of the planes on the escarpment of the terrain model (contour leveling) is automatic. The three-dimensional representation of the project is immediate, fully interactive and easy to make.